Last updated 28 September 2018 . By Georgia Evans. 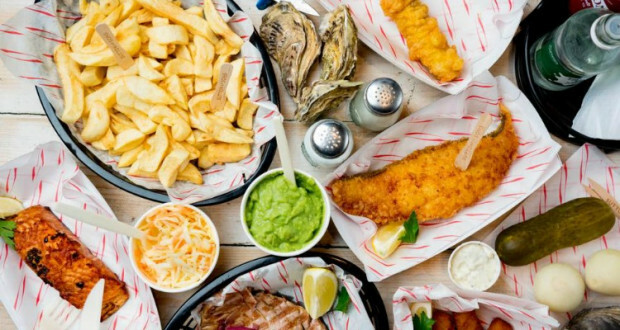 Veganism shows no sign of slowing down as East London fish and chip shop Sutton and Sons is re-launching its Graham Road restaurant with a completely vegan menu. Joining the likes of Tell Your Friends, by Chloe, and even chicken-shop Buster Mantis, the family-run business is ditching the meat and fish, and going plant-based, making it (most probably) the first fish and chip shop that doesn't serve battered cod. Last year, Sutton and Sons announced the addition of a meat-free menu which included a fish substitute made of banana blossom marinated in seaweed which has since become a top seller, and will be sold as a replacement for cod, fish cakes and even be served as a burger. Other signature dishes include the vegan prawn cocktail, scampi with chips and a Lincolnshire-style sausage with vegan pork, battered and served with chips. There will also be a lovely-sounding drunken mushroom pie with spinach, red wine and a sweet onion gravy, served with mash.